When Christmas rolled around I decided Regan needed something as manly as he is. So naturally I made him a cowboy wallet. This tooled leather is really terrific and I know it’s been in my employer’s stash for years, just waiting to come out again for the perfect project. She’s made her fair share of amazing bags from it and was kind enough to let me take enough for this tiny project. Her ability to source is a talent that rivals her ability to design. I feel like every day I’m in the studio I unveil something new and amazing. 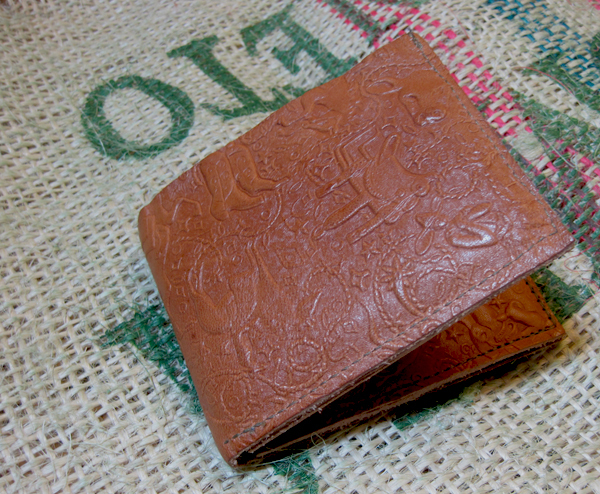 This is made with unlined leather and all raw edges. For that reason it’s simple and you could make something similar with vinyl, felt or leather. It requires just six rectangles. 1. 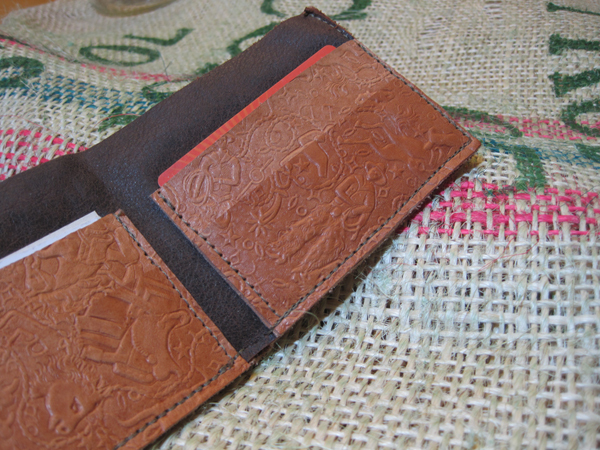 First you will make the interior of the wallet with the credit card holders. 2. On interior rectangle, with right side facing, place one back credit card holder and one front credit card holder at bottom left of interior rectangle. Make sure the left sides and bottom edges are all flush with each other. Stitch along the left side, bottom and right sides. 3. Repeat step 2 on the right side of the wallet’s interior so that it is a mirror image. Please refer to the first image in this post if these written directions are unclear. 4. Now that the interior of the wallet is ready to go and all credit card holders are in place, you can sew on the front of the wallet and create a place for your wads of cash. 5. Fold your exterior rectangle in half evenly and, at the very bottom, mark the center with a piece of chalk. 5. Place wrong side of exterior rectangle to wrong side of interior rectangle, lining up the left and right sides evenly. The interior rectangle is slightly smaller than the exterior rectangle so that the wallet naturally pulls shut. 6. With front exterior facing, stitch the exterior and interior rectangles together. Start at the upper left corner and stitch from top left corner to bottom left corner, turn and stitch along the bottom of the wallet towards center. Stop stitching approximately 1/8 of an inch from the center line. 7. Repeat for the right side of the wallet, starting at the upper right corner and stitching to bottom right corner, then towards center, stopping 1/8 inch from the center line. 8. Finish all loose ends. Trim uneven edges, if necessary. Oh man that is awesome! Digging the leather stuff. I can’t believe Regan didn’t show this off last week. Then again, most cowboys don’t like to brag. Thanks, Jason! He is a real cowboy, that guy.